The revolutionary design of the IT Multi-Tool allows all the common tools used by technology professionals to be combined into one sleek device. Techs and uber geeks alike equipped with the IT Multi-Tool will no longer have to search or return to the truck for the right tool to finish the job. 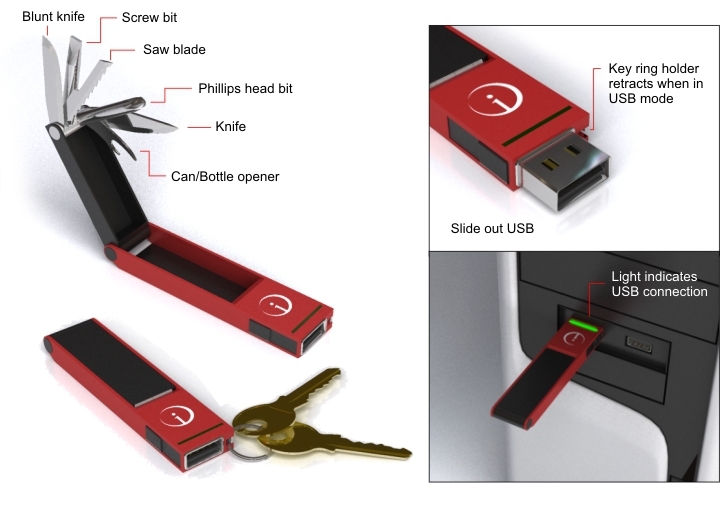 The IT Multi-Tool includes two knives, a saw-blade, phillips and regular screw driver bits, a can opener (just in case you are working on a computer while stuck in a bomb shelter) and a slide out USB storage drive. As mentioned before, the tool attaches to a key ring - when the USB connection slides out, the key ring automatically detaches. This feature prevents strain on the computer components, and allows the user to access the USB port more effectively. This device was created with technology professionals in mind, but it has obvious merit to almost anyone familiar with computers. Almost everyone under 30 has a USB drive in their pocket, why not have a device with the added features of the IT Multi-Tool?